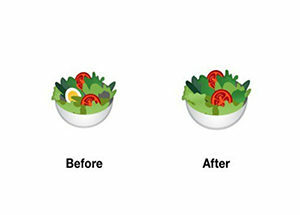 Jennifer Daniel, UX-Art Manager of the Expression design team at Google, tweeted about removing the egg from their salad emoji for Android P Beta 2. It may seem like a small edit, but by doing so the emoji is a “more inclusive vegan salad,” she says. This inclusive reference stems from a larger issue that Google’s corporate culture has faced over the past year. Google’s parent company, Alphabet, has been scrutinized on how they handle diversity and equal-pay issues. When it comes to convincing consumers that they are committed to diversity, unfortunately, removing the egg from a salad emoji doesn’t cut it with Twitter. This egg-removal and tweet from Daniel sparked a large thread of conversation, consisting of mostly sarcastic remarks and jokes. Regardless of the backlash, Google is still moving forward on 157 new emoji updates.